Around 5:30 in the morning I woke up to a huge bang. It wasn’t right at the boat, but it wasn’t too far away. Initially I thought it was the pop of a cliff letting go, but a few minutes later a bright flash told me exactly what it was-thunder and lightning. That’s pretty rare in this part of the world. Given the early hour I went back to sleep for another few hours. Around 8:30 I actually woke up, and the sunshine and clear skies of the last several days had given way to low clouds. I had planned on going up Kynoch Inlet and anchoring for the night in Culpepper Lagoon, but given the low visibility I didn’t see much point. The scenery would have been hiding out in the clouds. 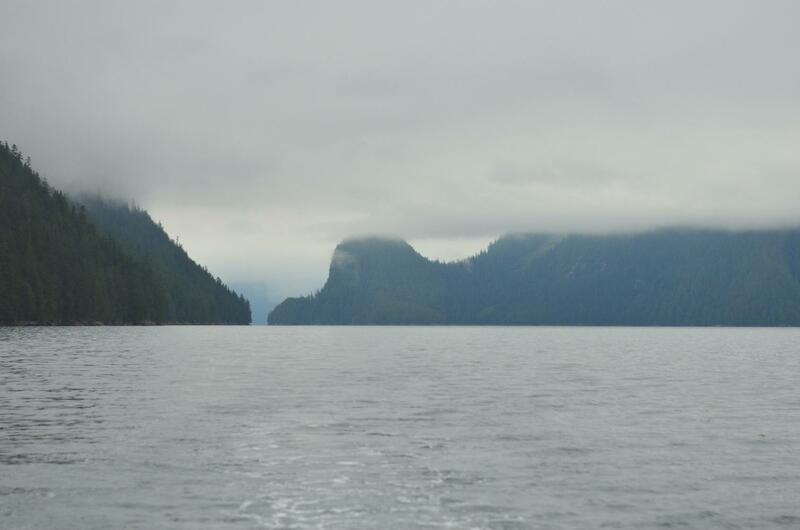 Instead I went to Rescue Bay, on the east end of Jackson Passage. The trip down was uneventful and calm and I even had a nice current in my favor. When I arrived at the anchorage mid-afternoon, I was the only boat around, and it stayed that way until late in the evening when one other boat came in. I enjoyed the solitude and calm water, exploring the whole bay by kayak. The scenery wasn’t as impressive as the fjord I stayed in last night, but it was still beautiful. One of the ‘problems’ with seeing so much really stunning scenery and wildlife is that it resets expectations. The least impressive areas up here are like an untouched, uninhabited, and uncrowded version of the San Juan Islands, which are in their own right rather spectacular.